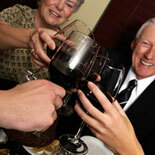 The perfect way to celebrate birthdays, anniversaries or any special evening for parties of 2 to 20 guests. 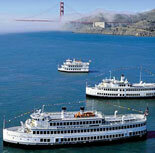 Aboard the dinner-dance cruise you'll enjoy delicious food, live entertainment and breathtaking bay views. Arresting skyline views of the "City by the Bay"
Welcome to the Hornblower Experience, where the celebration begins the moment you come aboard. Start with cocktails on deck, then relax as gracious crews transport you to a world of ease and luxury. Celebrate, dine and unwind aboard a three hour Dinner Cruise that is unbeatable. 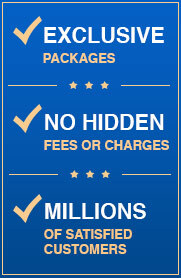 Delicious food, your favorite beverage, live entertainment and personalized professional service in one package. Experience the magnificence of the San Francisco skyline from Hornblower's deck, or through bay view windows from your dinner table. After boarding, the captain and marine crew will direct you to your deck, then the hostess will show your party to your assigned dining table. 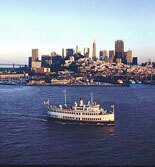 Take a stroll, or just relax, then prepare to indulge in the finest in gourmet cuisine on San Francisco's Bay. Only on a luxury yachting adventure can you feel this pampered, privileged, relaxed and refreshed. It takes the art of entertaining to a whole new level. No matter what the occasion, the Hornblower's professional staff can personalize arrangements, tailoring any event to suit your needs. So whether it's a romantic evening for two, a birthday celebration or a wedding anniversary. you will remember it for years to come! Make your reservations and get your eTickets today... Hornblower promises you an unforgettable experience! Board: 6:30 pm | Cruise: 7:00 pm | Return: 10:00pm. 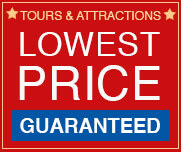 Nov: Thurs, Fri & Sun; Dec: closed for voucher travel. Cruise dates and times are subject to change by season. Hornblower Landing at Pier 3 on the Embarcadero, San Francisco, CA 94111 | Pier 3 is at the foot of Washington St, between Market St and Broadway. 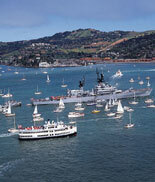 Parking is available at Hornblower's Parking Lot | Limited public parking is available at Pier 3. $10.00 per car and $20.00 during New Year's Eve events | Contact customer service for details and transportation options. Children ages: 4 to 12 years old. Children under 4 are free.